The Parlour Inn offers an array of the warm and inviting accommodation options to make your stay in Stratford as relaxing as possible. 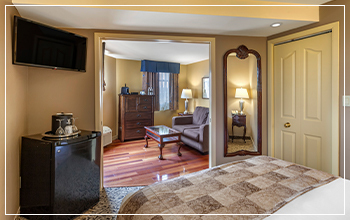 Each of the 28 guestrooms at The Parlour Inn is designed with a blend of warm, contemporary and antique furnishings. All our guestrooms are beautifully decorated and have a unique layout. Adjoining rooms are also available, to accommodate larger groups. 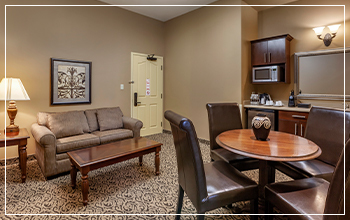 Our hotel rooms come complete with modern amenities and are elevator accessible. The character and vintage charm of this landmark historic Inn, originally built in 1871, can be found throughout the building. We are perfectly situated in the heart of Downtown Stratford, just steps from the Avon Theater and the amazing shops and boutiques that downtown Stratford has to offer. The Parlour Inn is also thrilled to welcome guests who are visiting with their pets by offering a select number of dog-friendly rooms. At The Parlour Inn, we have a wide selection of hotel rooms available to suit the needs of any visitor. Traditional Rooms offer a Queen Bed and table for 2. At approximately 200 square feet, these well appointed and immaculate guestrooms provide every essential for your visit. The Traditional Room offers 3-piece bath. These rooms are best suited for guests who have activities planned outside the hotel, such as theatre, shopping or meetings. 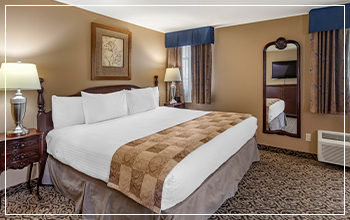 Superior Rooms offer a Queen Bed, sitting area, mini fridge and 3-piece bath or King Size Bed with 3-piece bath. 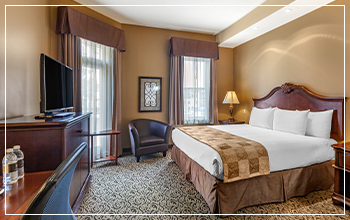 Superior rooms are a little larger than the Traditional Rooms and face the historic downtown. 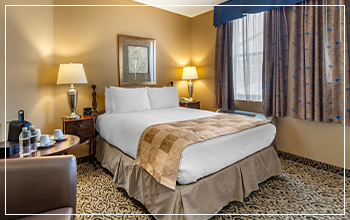 Deluxe Rooms offer 2 Queen Beds or 1 King Bed and are more spacious at approximately 260-300 square feet. Deluxe Rooms include a mini fridge, providing ideal comfort for longer stays or travelling with family. These rooms offer the additional space to accommodate a cot. The bathroom is equipped with a single whirlpool soaker tub. Luxurious accommodations with a King Bed and separate living area. Each King Suite is individually appointed with unique features. Some may include a wet bar and mini-fridge, sofa bed, fireplace or whirlpool soaker tub. These suites offer the ideal comfort for your visit to Stratford, especially for longer stays and special getaways. These exceptional & spacious suites, offer over 450 square feet are perfect for 2 couples or family & friends travelling together. Each bedroom offers 1 Queen bed with its own ensuite. The separate living area is shared and includes a pull-out sofa, wet bar with mini fridge & microwave and table for 4. Both bedrooms and living area are equipped with a flat-screen television. Our 2-bedroom Suite offers the ultimate retreat with every convenience. You will want to stay longer! 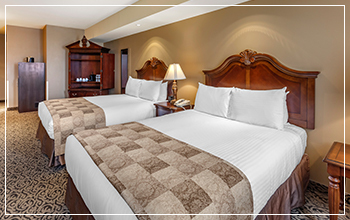 The Parlour Inns rooms are the perfect place to stay when visiting Stratford and scenic Southwestern Ontario. All of our rooms can be booked in advance when planning for a wedding, meeting or special event. Contact The Parlour Inn today for advance booking options. Check-in time is 3 pm and check-out 11 am. Advance Deposit of one-night room & tax will be taken as guarantee for stays May through October. 7-day cancellation policy for full refund. For stays November through April, no advance payment is taken, but for cancellations after 4 pm on the first day of your reservation, the full price of the room & tax will be charged to the credit card on file. Check out our getaway packages for great deals on vacations in Stratford, Ontario!